Skyscrapers and sports arenas loom overhead on the skyline, along with the twisting concrete expressway. A walk beneath the highway reveals landmarks and signs of great wealth off to the side, and also unmistakable signs of poverty—a veritable tent city beneath the road. Traffic roars overhead in another world. The place is heavy, overpowering. Walking through this part of town, one can see the downtown vista, the Superdome, the Union Passenger Terminal, TV studios, satellite dishes, church spires, panhandlers, camping tents, blankets, drifters. One can turn off at Lee Circle, a former monument to the Confederate general, and then travel another block to find modern art galleries and other tourist destinations. At Lee Circle, General Lee is gone, an empty pedestal the only sign that he was ever there at all. Removed. The city has decided he wasn’t the best choice to tie the place together in a city that is both majority African-American and deeply tied to the history of slavery—especially considering the recent visibility of white supremacist groups. But after a flurry of movement against such monuments last year, there’s been little further action, little drive to revamp these spaces. They sit there. The city had plans to replace the pedestal with a water feature, a kind of aggressively non-symbolic marker—and perhaps an admission that there’s nothing that everyone could hold in common, nothing that could resolve this part of town’s contradictions. What could go in the middle? I decided to ask the people I encountered around the Circle who they’d like to see honored there. I meet a couple people who are sitting and drinking together along the sidewalk around the empty pedestal. After a quick introduction they’re happy to talk. Jeff is an older man, with a wrinkled face, a short beard, and a slightly gruff voice. Next to him is Adam, young and curly-haired, who speaks with a constant good humor. They’re sharing Yuenglings together. Adam is happy to see Lee gone. When I ask who he’d put there instead, he tells me: “Richard Dawkins, or Charles Darwin. Or Carl Sagan.” Adam tells me they represent “logic and education.” Adam has an inverted cross tattoo on one finger. His irreligious attitude clearly vexes Jeff a bit, though the other man remains respectful. “Or they could put up a drunk bum,” Adam says. “This is a homeless city, anyway.” He’s speaking in a jokey tone, but there’s a certain edge to his words. “It should have been voted on by the city,” Jeff says. “Landrieu was wrong to take it on himself, behaving like a dictator.” He says he would have let the city decide by referendum, and doesn’t want to suggest another figure to replace Lee. 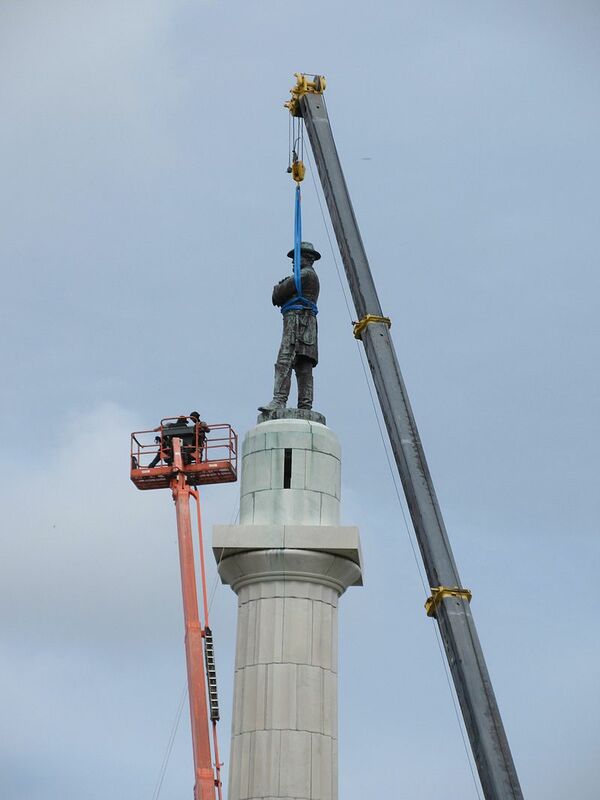 He says the monument’s removal was a diversion. “Why is Andrew Jackson still up?” he says. “Why is Jefferson still on Rushmore? Should we just blow it up?” He leans toward me in a conspiratorial fashion. “Want me to blow your mind? 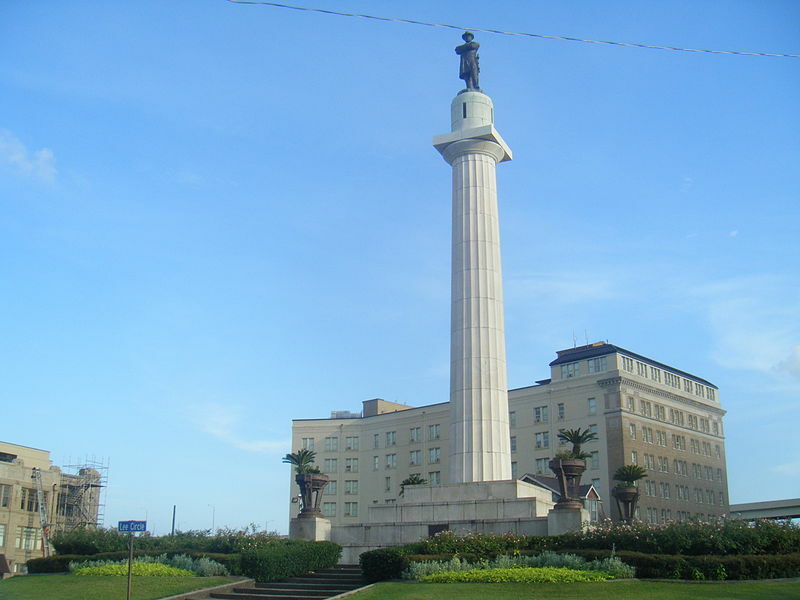 If Landrieu really went to the City Council and got their approval, why did he have to go through private funds to get the statue removed?” He puts both hands out for emphasis. “I would have taken it down for $50 and a case of beer,” Adam tells me. A group of tourists walk past behind us. Soon, we’re joined by an older black man in a camouflage cap, who introduces himself as “The Riddler.” He says he’s been telling riddles for thirty years, and entertains us with a few, which me and Adam try to guess the answers to (one punchline: “He should have quit while he was a head.” Another: “A fat chick.”) I ask the Riddler about the monument. “I could care less,” he tells us. “I wanted it to stay. It used to be people just went there, sat, drank, and had fun. That man is dead and gone.” He seems to resent the politicization of the space—though many might say it was always political, if unexamined. “What would I put there?” he says. “Secretly, another Lee.” He laughs, seeing some humor in the thought of annoying people this way. His position strikes me as unusual. But perhaps he’s not in a position to care too much about this kind of thing. The Riddler turns a little more serious, telling us his real name is Daryl. And he tells me a Hurricane Katrina story, saying how he was in prison at the time, and that the inmates were abandoned as the water rose. He finishes by casually asking if I could spare some money. I politely decline, having none on-hand, and wish him luck. Even the city’s street people don’t necessarily have that much in common. Adam is currently homeless, but says that he himself chose to live that way after moving to the city, until his wife arrives. He believes he’ll have work soon, and currently claims to be learning about and documenting the homeless experience in the city. But he seems to look down on many of them—perhaps believing it’s justified based on his own proximity to the issue. Jeff isn’t so forthright with his story. Conversation verges far from the monument. Many of the other people I meet nearby have just left the World War II Museum, a large, gray, strangely slanted complex right next door to the Circle, which celebrates a “good war” that all Americans can be proud of. These visitors are older, and almost all white. The Confederate Memorial Hall museum, just across the street, is far smaller and much less popular, though its 1890’s architecture fits much more easily into the city’s landscape. Memorial Hall, a video tells visitors, was once a popular place for local Confederate veterans to hang out and reminisce about their experiences during the war. As such, it was bound far more inextricably to the city itself than later, more tourist-geared attractions. Exhibits include large Confederate battle flags, soldiers’ uniforms, weapons, and relics related to Jefferson Davis’s family. References to slavery are sparse. The gift shop includes Confederate flag caps and rare DVD copies of Song of the South, a film permanently confined to the Disney vault for its idealized plantation setting and racial stereotypes. At Memorial Hall, Louisiana’s Confederate history is openly celebrated, but also kept locked up and secluded in a small and stuffy building, out of the public square. Emily, a tourist from Ohio, carries a WWII Museum tote bag as she waits for the streetcar. I broach the topic of Lee, pointing to the empty pedestal at the circle’s center. She expresses distaste for his removal. “You can’t rewrite history,” she tells me. “It’s a reminder.” When pressed a bit about whether Lee is worth honoring, she tells me “He was a patriot in his own right.” But still, she says, “In this day and age we don’t look at a statue and go, ‘Oh wow, I should be like that.’” She sees the monument as a neutral reference to history rather than a tribute. Still, she’s adamant that Lee belongs there. “I would put him back,” she says, voice firm. Another tourist, Sue, tells me she’s glad to see Lee gone. “I agree with it,” she says. “I don’t know why they were celebrating him. They lost.” But when asked about how to replace Lee, she comes up dry. Her husband Bill cuts in. “Barack Obama?” he says, half-joking. They both laugh a bit. “We like Obama,” Sue tells me. After some more thought, Sue suggests “A prominent New Orleans person,” though she doesn’t know enough about the city to offer a specific figure. There are many famous New Orleanians who might qualify. But it’s hard to say if anything could really reconcile all of these very disparate elements together. As I finish my conversation with Adam and Jeff, the two street people from before, they argue about religion. But when they talk about their ideal world, it seems to be the same ideal. Both agree that there’s a lot that divides people (which Adam pins on organized religion, and Jeff on people misinterpreting their traditions). “But we’re supposed to love each other,” Jeff says. He’s just returned from a store with some assorted snacks. “Can’t we just sit here and eat chips together?” It’s not too eloquent, but he speaks to a real hope of reconciliation. Chris Pennanen is a senior at Tulane University studying English and Economics.